I have lived on a small farm in Jessup, Maryland for 40 years. Our ponies and horses reside with us, along with an assortment of other farm animals. I was 5 years old when I got my first Shetland pony. Her name was Flicka, and I will always remember riding her through the fields and woods on the farm, especially when it was time to work. I still enjoy riding, participating in team penning events, wagon trains and trail rides. My family and I have been around farm stock all of our lives and with their help, we have been able to share our ponies with others. For six years we have been doing Birthday Parties, Church Festivals, School Festivals, Company Picnics, Family picnics, Block parties, and just about every other function where kids and ponies are appropriate. So far, we have gone from Hagerstown to Southern Maryland, from the Potomac to the Eastern Shore, including downtown Baltimore and Washington, D.C..
Our set up is family-oriented. My two sons Brandon and Jacob, along with my wife Irene, make it possible for us to bring smiles and laughter to children of all ages. 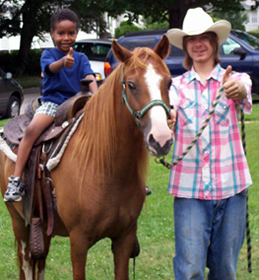 Our focus is to provide pony rides that are SAFE and FUN for the children and the ponies. Let us bring to you those memories your children will remember for a lifetime.